Deloitte Off Campus 2019: Apply now for Deloitte Off-Campus drive through our website. So, all 2018, 2019, 2020 Passouts can hereby apply for the Deloitte Off Campus. Furthermore, Deloitte is also offering IT internship jobs and vacancies for entry-level engineers. In addition to this, we provide the entire information about Deloitte job opening across India. And also, the registration process, eligibility, selection process, drive details, marks criteria and eligibility criteria are given in the following sections of the article. Moreover, Deloitte is a Multinational Company which is offering a dream job for freshers through the coding and communication skills they have. Therefore, the candidates can now apply for, Deloitte Recruitment Process by reading our whole article. Deloitte is now hiring freshers, who are skilled and talented across India. The aspirants who are willing to join this company can now apply for this job through the registration process given below. 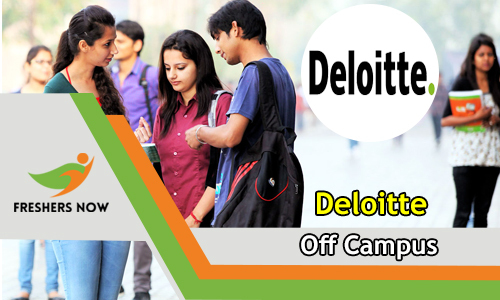 Deloitte Off Campus 2019 is conducting an off-campus drive for freshers, graduates, and postgraduates through Off-Campus and On-Campus. Therefore, the members who want to join Deloitte can now register through the link given below or through the official website @www2.deloitte.com. Here we are providing you the whole information about the Deloitte Off Campus, Deloitte Recruitment process through our website. Aspirants should meet the eligibility criteria. Furthermore, aspirants should practice placement papers and online mock tests. From the below sections you can check out the entire overview of Deloitte and Deloitte Recruitment process. Therefore, the candidates can now register through the link given below. Presently, there are Deloitte openings in Hyderabad and Deloitte Bangalore walk-ins. In addition to this, people can now check the Deloitte Off-Campus 2019 drive details from the above table. Students who are B.E, B.Tech, MBA, BCom, B.A, M.Tech, etc., are eligible for the drive. Furthermore, Deloitte is offering a golden opportunity for freshers. The job role in Deloitte is of many sessions like Trainee Engineer, Software Trainee, Network Engineer, Business Analyst, etc. We all know that Deloitte is one of the topmost MNC and everybody wants to get placed in such company. Not only, having a dream is important but also, you have to strive hard to attain this job. Comparatively, many people have a doubt in their mind. Why Deloitte? why not some other company? here is the detail explanation of one of the topmost MNC none other than Deloitte. The Deloitte is a UK Multinational Professional Services Network. And Deloitte is one of the fourth topmost professional services networks in the world. Deloitte offers audit, tax consulting, enterprises, financial advisory services worldwide. Furthermore, Deloitte is the sixth largest privately owned companies in the United States. Deloitte currently has the highest market share in auditing among the top 500 companies in India. It was found in 1845; 173 years ago in London, England, United Kingdom. There’s no question that today’s technologies are blazing exciting new paths. But innovation isn’t always about technology and invention. At Deloitte, it’s also about the collaboration of our people. Furthermore it’s about rethinking and recombining existing tools, methods, and ideas to achieve stunning new results. We create a workplace where people are rewarded for this kind of curiosity, creativity, and collaboration. Here, you have the freedom to be innovative to see the world differently, develop your ideas, and realize your full potential. Many companies champion diversity. That’s an important start. But for diversity to truly have an impact, the culture should also be inclusive – a place where every voice is valued and people feel safe to participate, engage, and share ideas. That’s the culture we are creating and fostering here, and it spawns an environment of support, trust, and, most importantly, effective ideas. It’s a culture that’s not only good for our clients, but it’s also good for your career. In addition to this, you can now apply for Deloitte Off Campus 2019 an individual should meet the eligibility criteria. Furthermore, the contenders need to check the following profiles in order to meet the eligibility criteria. Therefore, to get the place in a topmost MNC an individual should have the following qualities. And the candidates who are willing to join the Deloitte should now clear the marks criteria given below. Backlog The students of B.E/BTech/MTech/MCA/MBA should have 60% in their 10th standard, Intermediate, Graduation and Post Graduation. Therefore, the aspirants who want to attend the Deloitte Off Campus 2019 should not have any backlogs. Therefore, candidates are suggested to clear the backlogs before joining the company. Basic knowledge on IT related technical terms like CPU, memory, server, network, IP address, etc. In general, the selection process is as similar to other IT Industries. Not only written test, technical and HR but also there is a group discussion round. The Dell is conducting following are the rounds in the Deloitte Off-Campus drive, Deloitte walk-ins, and Deloitte recruitment process. After qualifying the eligibility criteria the students have to bring the following certificates. You have to register through Deloitte official website @ www2.deloitte.com. After registering, you will be receiving a unique reference id and password. You will find some empty boxes where you have to submit your details and interests. After submitting your details click on Save and Next.